It's like a degree in elite nutrition coaching. Exclusive for health and fitness professionals from Dr. John Berardi. BOOST YOUR NUTRITION SKILLS WITH THIS FREE COURSE. send my first lesson! Without nutrition and lifestyle coaching, most clients won’t see the results they want. And you’ll struggle to build the business you want. 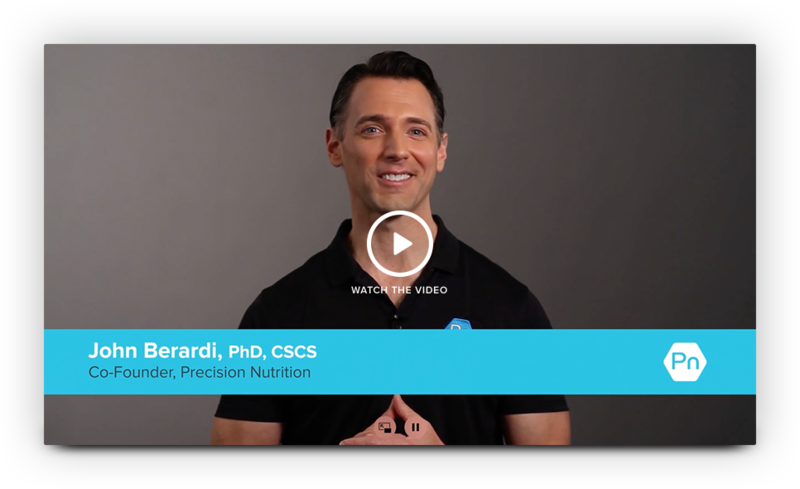 Hi, I'm John Berardi, co-founder of Precision Nutrition. Over the last 15 years my team and I have coached over 100,000 clients in 100+ countries; educated over 50,000 health, fitness, & wellness professionals; validated our work in multiple peer-reviewed journals; been featured in top publications, and consulted with the world's biggest companies. — even when they’re not with you. Through our industry-renowned Precision Nutrition Certification we’ve already taught over 50,000 health & fitness pros how to get better results with their clients. What nutrition/lifestyle advice you can actually give. How to get clients to follow that advice. How to assess your client’s needs. How to give advice based on that assessment. What to measure and exactly how to measure it. How to optimize a plan based on those measures. Plus, we’ll share the 30+ nutrition and lifestyle questionnaires, assessments, and worksheets we use every day at Precision Nutrition. This course is completely FREE. coaching like a pro. Simply add your first name and email address to get started. continuing education credits with the following organizations, among others.